The final number for activations for the months of December and January to date (excluding training) was 24 compared to 17 the previous year, up 41%, so the upward trend is continuing. Biggest increase is in medivacs which is up to 9 compared to 4 the year before. 332 people that were in some sort of trouble, and our volunteers – none of whom are paid – spent more than 2000 man hours on the water. Well done to all of our volunteers! It is a great commitment to the safety of the boating and island communities of the Whitsundays. Over the last few months, a separate Sub-committee have been gathering data and analysing the feasibility of a second vessel, carefully selected to complement the primary VMR1 rescue vessel and improve and enhance local VMR coverage. More about that below. The AIS installations on Hayman and Mt Robinson are nearing order stage, which we hope to have done next week. And the VMR Ball is back! Lock in March 15th for the Toga Party at the Marine Club. There will be a catered dinner, live music, door prizes, and the usual fundraising auction with some excellent items up for grabs, all aimed at raising funds to help us do what we do best – saving lives at sea. You can book a table of 10 or take potluck – either way it should be a great night! I am very pleased to announce that VMRW Secretary Roger Wodson has been awarded the Senior Citizen of the Year Award at the Australia Day Awards by the Whitsunday Regional Council – a very well deserved and widely praised recognition for Roger’s outstanding efforts for VMR Whitsunday and the community – thank you Roger, well done. Our congratulations also to some close friends of VMR. The award for Citizen of the Year went to Merewyn Wright a Rotary Club of Airlie Beach stalwart. $100,000 to the acquisition of our VMR1 rescue vessel and is always busy on Rotary work. She has been elected as the incoming Rotary Governor for the Rotary Zone which covers “as south as Airlie Beach and Proserpine up to Thursday Island, Mount Isa, and covers Timor Leste, Darwin and Tennant Creek in the NT.” Congratulations Merewyn for your well-deserved award and thanks for your tireless work in the community. As mentioned above in the President’s Report, VMR Whitsunday activation levels have increased significantly. We are also delighted with the performance and configuration of Abell Point Marina VMR1, our NoosaCat rescue vessel. It has been in service for 18 months with outstanding economy and has exceeded our design expectations in every way, particularly in difficult sea conditions. As our primary rescue vessel, we could not ask for anything better. During this time we have almost completed a total replacement cycle of our major assets in the Whitsundays – latest technology, more resilient and upgraded VHF radio repeater installations on Whitsunday and Hayman Islands, replaced and sold our Kevlacat rescue vessel, and refurbished and repainted our Whisper Bay headquarters. We have also questioned whether a second smaller vessel to handle shallow and sheltered waters could relieve VMR1 from simple activations and extend its life, whilst operating at an even lower cost. Since the middle of last year a separate Sub-committee comprised of Ron Roberts, Michel del Aguila, Marti Davy and Trevor James has been gathering data and analysing the feasibility of a second vessel, and found that some 25% to 35% of activations may be handled by a smaller vessel. Features of the vessel would include a two man crew, faster to activate, lower cost of operation and ability to access shallow areas in Muddy Bay, Pigeon Island and sheltered waters in the Whitsundays. VMRW does more activations than VMRs in Burdekin, Mackay, Bundaberg, Gladstone, Victoria Point, and Brisbane – all of which have 2 or 3 vessels. operate in shallow water such as Whisper Bay and Port of Airlie, improve shore searches and person retrievals from shore and raise public awareness of VMRW in the region. The second rescue vessel could displace the operational hours and thus may extend the life of the primary rescue vessel which implies a potential cost saving overall. My thanks go to the sub-committee for their time and effort that has gone into the report. The Sub-committee has recommended proceeding further with the study, and the Management Committee has examined the proposal and is satisfied as to our financial capability. It has endorsed the recommendations of the Feasibility Sub-committee, and we now move to phase two of this project – which will follow the proven rigid processes undertaken with the purchase of VMR1, including consultations with senior skippers and crews, formation of a new sub-committee to specify and select a suitable vessel (for recommendation to the Management Committee), and approval by voting members. The next step on the way to a 2nd vessel, following Management Committee endorsement, will be to call a special General Meeting for all active members to vote for or against the proposal. If approved, a small sub-committee will proceed to phase 2. A date for the general meeting will be announced shortly. Did you know that each VMR location is a separate incorporated organisation? In general, each has its own membership arrangements and benefits and you need to have a separate membership wherever you launch your boat. VMR Whitsunday has reciprocal arrangements with VMR squadrons at Midge Point, Bowen and Burdekin (Ayr). If you are a current financial VMR Whitsunday member, you are also covered if assisted by these locations but not in other locations. If you require cover anywhere else, you should take out a membership at that location. Full details are on the Application for Membership page on our website. You should launch your boat in the area where you will be boating. VMR Midge Point, Bowen or Burdekin may assist you, but you will be taken to a safe haven within their zone. VMR Whitsunday operates from Cape Conway in the South to Cape Gloucester in the North. The Where We Operate page on our website provides a map of local indicative VMR zones. Queensland Fire and Emergency Services (QFES) has recently released the Blue Water Review report into Queensland’s volunteer marine search and rescue organisations. The Review examined and identified issues in the provision of marine search and rescue services by the two volunteer organisations: The Australian Volunteer Coast Guard Association (AVCGA) and the Volunteer Marine Rescue Association Queensland (VMRAQ). The plan is for QFES to form a working group, which would include members of both services, to consider the observations raised in this report. The working group will work with QFES to form the future of volunteer marine rescue services in Queensland by the middle of 2019. Interesting times ahead! You can find a link to the review HERE. VMR Management Committee will be making a submission, and individuals may do the same to QFES.Engagement@qfes.q1d.gov.au. How well do you know your ‘Boat Stuff’? Here’s a quiz from the Department of Transport and Main Roads (Queensland). When approaching another vessel head on, which way should you turn? Of course you know, and you’ll find the answer HERE under Collision Regulations. Always good to get a refresher! Everyone Loves a Discount, Especially off Yummy Food! As Mal explained in his President’s Report above, a huge benefit of VMR membership is feeling safe out on the water, but we have been working with some local businesses to extend this benefit to something a bit closer to shore. Do you like seafood…or food in general? 🙂 How about 10% off at Fish D’Vine! Simply show your VMR Membership card when you visit. More benefits coming so we’ll keep you posted. There is plenty going on Abell Point Marina (our Platinum sponsor). Also Hemingway’s Restaurant is closing and will be revamped to a new style, including lunches. Did you know that they are holding public fitness classes this month? Taking placing on a weekly basis throughout the marina are a range of outdoor fitness classes, available to all. Tuesdays at 5.45pm, is Boxing for Fitness. Thursdays at 5.30pm is Sunset Yoga – both these classes are held on the grassed area at the top of M/N arm. Sunday mornings at the balcony at Lure, we have a Pilates class at 8am – all fitness levels welcome. In December, Abell Point celebrated with its operator occupants taking out 10 of the 14 2018 Queensland Tourism Awards, highlighting the quality and service provided by the APM precinct. The marina gardens development may look like an Olympic Swimming Pool today but is still under construction with an intended mid-year launch date. Plans for the waterfront open space are underway, and (weather permitting) strong progress will be made over the coming months. Abell Point Marina is the major point of entry for Cruise Ships visiting the Whitsundays with 50 of the scheduled 60 vessels disembarking its passengers there this calendar year. In late April, for the first time ever, Airlie Beach will welcome its 100,000th visitor on cruise ships in a financial year (since July 1st 2018). The War on Wrecks Taskforce has been undertaking state-wide public consultation to help identify unseaworthy vessels that can be removed from our waterways and to understand and remedy the factors causing this growing problem. By early December 2018, using the $20 million War on Wrecks fighting fund, a further 65 wrecks had been removed from Queensland waters, with contracts or compliance plans proceeding towards fruition to remove 143 more. A database of an additional 271 confirmed wrecks has also been compiled. The Taskforce needs and values the help of the public, so you can dob in a derelict and have your say by emailing WarOnWrecks@msq.qld.gov.au. When Debbie struck, Daydream Island was a silver sponsor of VMR Whitsunday and we are delighted to see that it will welcome guests again from 10th April 2019, unveiling a new look premium resort in the heart of the Whitsundays. 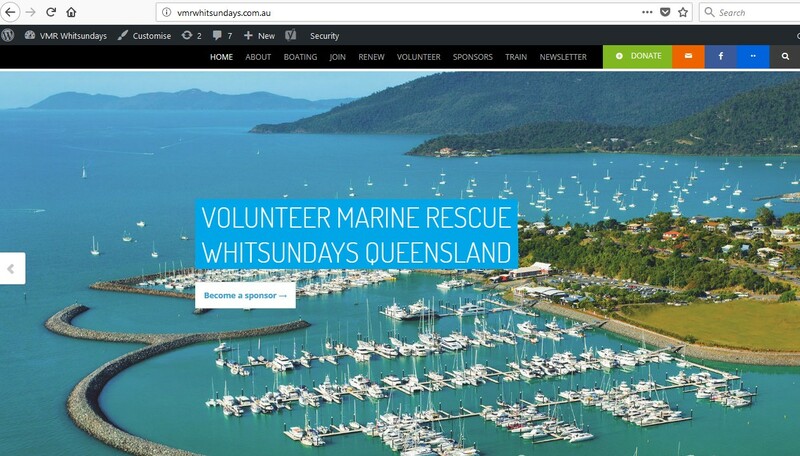 Daydream Island is in the centre of the VMR Whitsunday territory and in the past we have assisted guests or the general public in its waters – notably a successful night search for a missing windsurfing guest. That was until Cyclone Debbie struck and knocked out Daydream’s operations for two years. A $100 Million renovation by its new owners is now almost completed. Daydream Island will launch 3 new signature dining concepts, 3 relaxed bars, waterfront rooms and suites, as well as bring back the iconic Living Reef with an underwater observatory and education centre, plus the Outdoor Cinema. The resort will have 277 contemporary rooms and suites, with garden, pool and ocean view rooms providing the perfect retreat, The revitalized pool landscape winds through the tropical gardens across the resort, allowing guests to swim and enjoy unparalleled views. The Fisheries Research and Development Corporation (FRDC) have released a video to raise awareness of the dangers of the fishing and aquaculture industry. Mr Frisby said due to its large size, (greater than 4m) the crocodile must be dealt with as an ‘icon crocodile’under Queensland’s conservation laws. The animal can only be placed with a registered crocodile farm or zoo which agrees to use it for educational purposes about crocodile conservation. More info about this particular croc HERE. Might be useful to watch this safety video about launching your boat in ‘Croc Country’. Our volunteers take some fabulous photos while they’re out on VMR1- this was taken by Michel Del Aguila on a night-time activation. Yay….the VMR Social Meetings are starting up again for 2019! Grab that diary and add Monday, 4th February 6:15pm into it. Bunnings Sausage Sizzles – More for 2019! While you’re adding events into your diary, the VMR will be outside of Bunnings on Saturday, 9th February…..cooking up an absolute storm! HUGE thanks to Master Butcher’s who very generously donate sausages. That’s it for this edition! Click below to go to January’s activations.